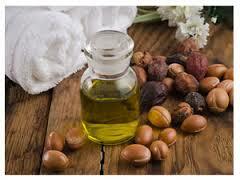 Argan oil seems to be everywhere! Whether I’m watching QVC or shopping at my local beauty supply store, it is apparent to me that argan oil is currently one of the hottest ingredients in the world of beauty. Actually, I have been enjoying a few products containing argan oil for quite some time, and I will tell you all about them after I divulge some of the secrets of this popular beauty marvel. 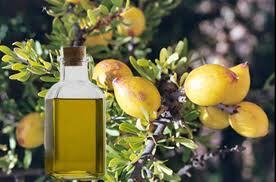 Argan oil has been the beauty secret of the Moroccan women for centuries. This precious oil, which has been referred to as “liquid gold” or “The Gold of Morocco,” is a rich source of Vitamin E and essential fatty acids. Known to be a “superfood” for the skin, hair and entire body, it has helped Moroccan women maintain supple, radiant, and glowing skin even in the dry climate where they live. 7. 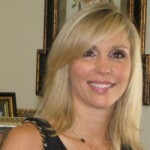 To help treat skin conditions such as acne, rosacea, eczema and psoriasis. 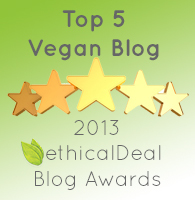 My favorite products containing argan oil are DermOrganic’s Argan Oil Hair Treatments which are cruelty-free and vegan. 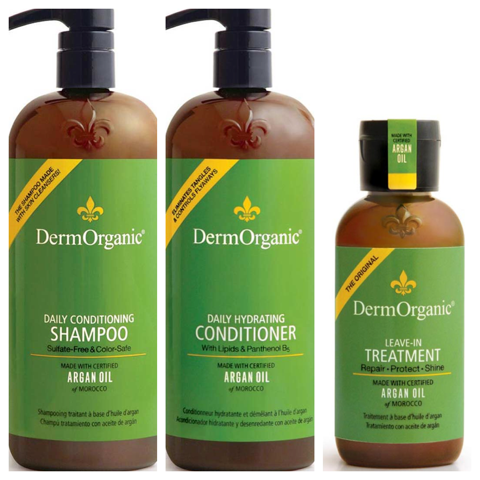 I have been using DermOrganic’s Daily Conditioning Shampoo, Daily Hydrating Conditioner, and Leave-In Treatment for several months, and they keep my hair conditioned without weighing it down. They are gentle enough to use everyday, and are sulfate-free and color-safe too. They have a nice light scent, and a creamy luxurious texture which lathers nicely during the shampooing process. DermOrganic’s hair product line also includes a Firm Hold Volume Foam and a Fast Drying Shaping Spray Plus Hold, which I have not yet tried. I highly recommend this line of hair care products. Another great vegan beauty product I have been using is Acure’s Facial Cleansing Creme With Argan Oil + Mint. I am a longtime fan of Acure’s Night Cream, so I was thrilled to try a sample of this cleansing cream which was given to me while I was shopping at Whole Foods. 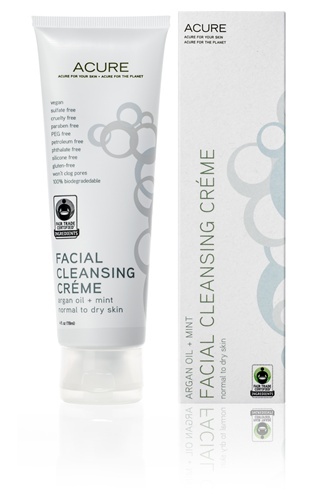 This extra-gentle creamy facial cleanser quickly removes my makeup without drying out my skin. It has a mild minty smell, and I was thrilled to find out that it is free of parabens, synthetics, phthalates, and silicone. In addition to Moroccan argan oil, this wonderful product is also made with organic olive oil, cocoa butter, blackberries and rose hips. 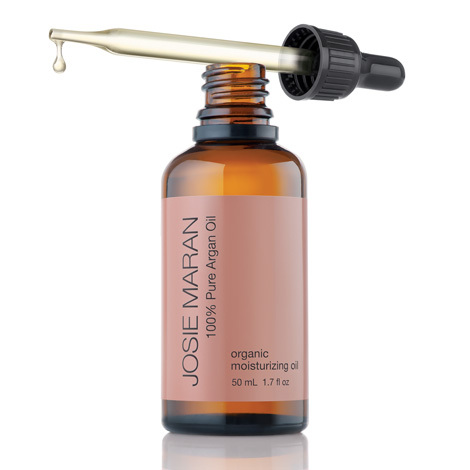 Lastly, I have been using Josie Maran’s 100% Pure Argan Oil for years as a daily moisturizer for my face, hair and nails. At first, I was hesitant to use oil on my face and hair thinking it would make my face too oily and my hair too greasy. However, this was not the case. In fact, a few drops “here and there” work wonders to make my skin glow, my cuticles soft and my frizzy split ends disappear. In the summer months, I even use Josie Maran’s Argan Oil to make my own homemade lavender mist. One of my favorite things about buying Fair Trade Argan Oil and products made with Argan Oil, is that it helps the Moroccan women, as well as the environment. 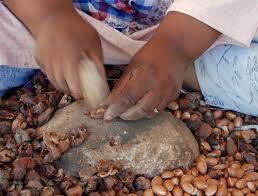 In 2002, the Moroccan government helped establish female cooperatives to manufacture Argan Oil. These programs provide the women of rural Morocco with a steady income, a fair wage, good working conditions, as well as literacy and other education classes. These programs also protect the Argan forests’ limited supply of trees because the co-ops are dedicated to responsible harvesting practices and reforestation projects, which (along with environmental protection polices) aid in the preservation of the Argan forests and women’s jobs. Click here to find out how to make your own homemade lavender mist using Josie Maran’s 100% Pure Argan Oil. It will help bring new life to dry, damaged hair, and leave your hair looking shiny and healthy. unless you know what that is.